Our complete curricula will guide your class through its entire noveling journey, with Common Core-aligned lesson plans from prewriting to publishing. Our workbooks help students create characters, build settings, and hatch plots. They can save their notes in free, downloadable PDFs, or you can order enough hard copies for your classroom. 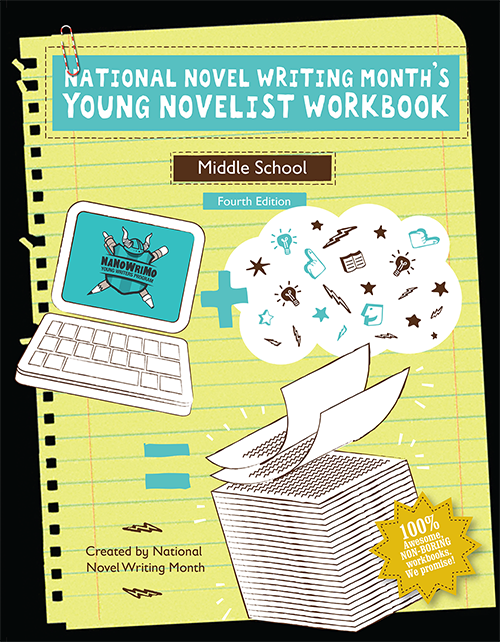 We offer a free motivational classroom kit to educators facilitating NaNoWriMo. It includes a progress chart, stickers, buttons, and a Writer's Emergency Pack. Look for free 2019 kits in August 2019! Or, purchase a group kit with identical contents for $5 or $10 now. 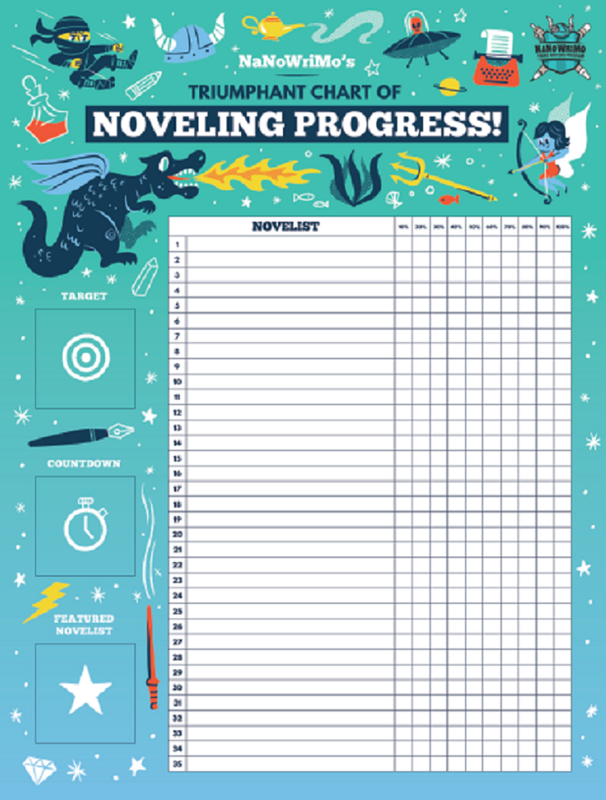 And download our free digital classroom kit, which includes a PDF version of the progress poster, printable workbook prompts, illustrated pep talk quotes, printable pep talks, 2018 winner and participant certificates, NaNoWriMo bookmarks, family letters in English and Spanish, and more! Learn how to print novels with our self-publishing partner, Blurb. NaNoWriMo participants get 30% off your first order, and 15% of your purchase goes to support the always-free YWP! Become a virtual classroom pro with our "Top 6 Most Useful Classroom Features You Might Not Know About". Read our word-count goal suggestions. Facilitating NaNoWriMo at a library or community center? Download our individual progress trackers and flyer. Check out our other noveling books in the NaNoWriMo store. NaNoWriMo’s Come Write In (CWI) program connects libraries, bookstores, and other neighborhood spaces with their local NaNoWriMo participants to build vibrant writing communities. Reach out to an all ages or youth-friendly one in your town! See list of participating 2018 locations. Led by expert NaNoWriMo educator Laura Bradley and Heather Gauck, the first session of PBS's free virtual professional learning series explored how mentor texts from The Great American Read, combined with the NaNoWriMo challenge, can empower students of all ages to read and write with enthusiasm and depth. Find all sessions here.